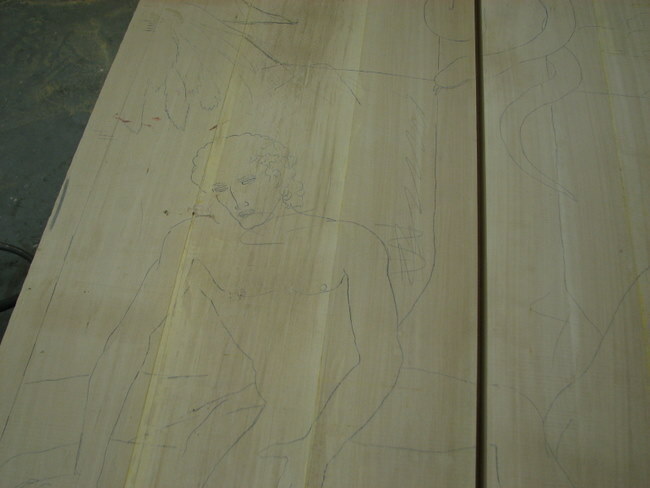 These photo’s by the way are an example of a piece being currently worked on at the Woodworking Studio in Bethlehem Pa. 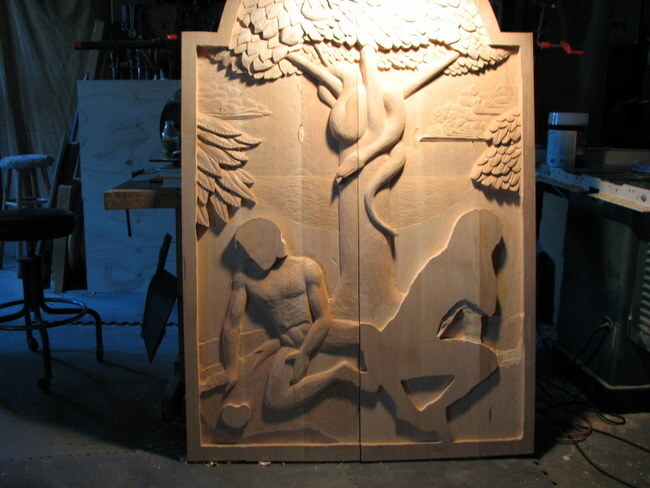 It will be two doors carved for a rather large Tryptich for a local church. These relief carved doors depict the scene from the Garden Of Eden. 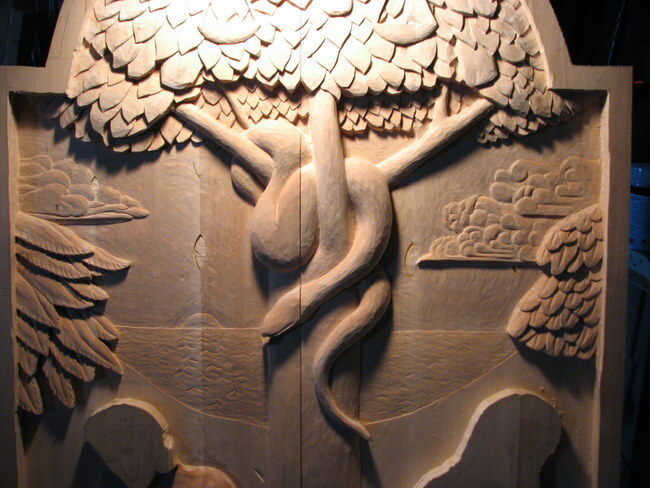 This section is of course the Tree of Knowledge with the Serpent and the scales of justice. 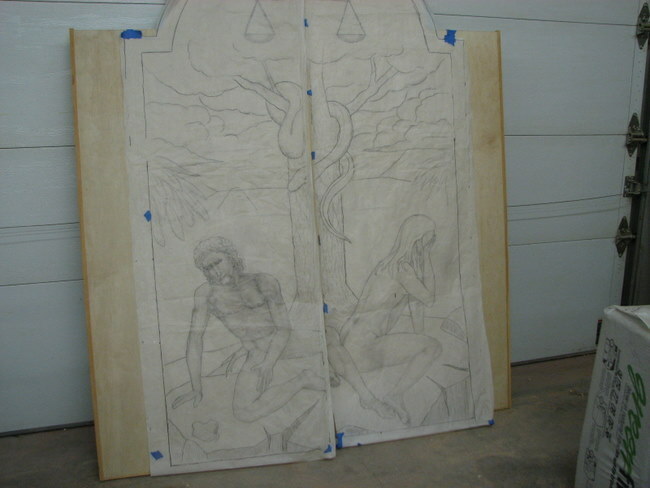 As the piece continues Adam and Eve will be shown along the lower section not shown here. The total size of the doors themselves are 4 ft wide X 6 ft tall. 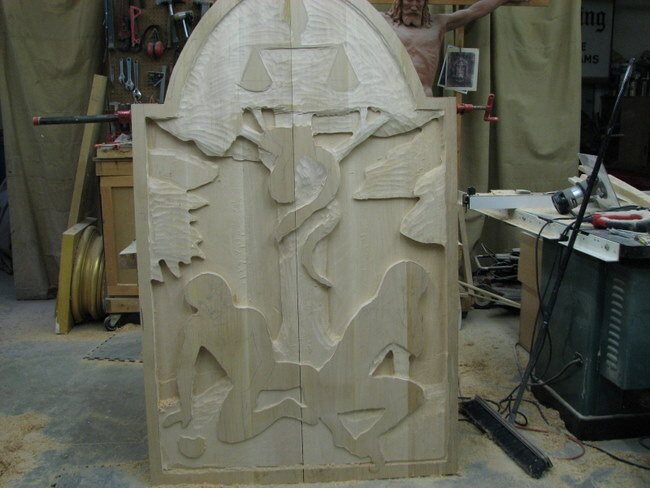 The total size of the Tryptich will be approximately 16 ft tall X 5 ft wide with extensive carvings both inside and out. Besides this piece there are many other projects in the works that will be shown as they evolve. Again, stay tuned and follow us along our carving journey. Hopefully you’ll be inspired to join in the fun! Like anything ,it’s a work in progress. I keep making changes as I go. Your awareness of the relative thickness of this piece to it’s size is very astute! I’m glad to know you recognize this fact. Considering the figure is approx. 3 ft tall,, and getting done in MAX of 1 1/4 inch,, and some areas I have 1/2 inch is quite a challenge. My approach is to simply compare one surface relative to another. And the difference in these planes aren’t much. You can’t carve a complete nose,, rib cage,, a leg coming out towards you in the traditional way. I almost look at this as if I’m deflating one of those big character balloons used in a parade. As it deflates and flattens out you can still see the image,,just flatter. It doesn’t look good from all angles,,but for the common view is where it needs to look good. All notions of what the different elements are and how to carve them go out the window. You carve a thick sketch if you will. Not 3D,, not 2D,, more like 2 1/2D. Then too landscapes and building appear in relief. They though are in some respects a bit easier. A building essentially if viewed 3/4 is two intersecting planes. Simple.And you can carve them in any size panel and still have them work. And a face can be carved into a coin ( I’ve always liked that example) so I can do this as well. yes, cleaning up is not washing with water and soap…i like to add to your considerations, that to my experience “fuzzies” occur from two reasons. the first is, as you mentioned, when one has not learned yet properly to use the tools with delicacy. the other is, and i think that is the biggest hurdle for beginners in carving, that the tools are not sharp enough and not sharpened properly. curved edges help a lot as you explained. Ahhhh Doris,, you’re preaching to the choir! Yes,, proper tool technique as well as a sharp chisel,, though mine seldom are! But there are ways around even this.That’s how I carve all day ,, and only strop once or twice. But as you know,, there is nothing quite like the finish a sharp,, well controlled chisel can leave behind. It’s like glass. Sanding only ruins the perfection of a chisel cut. That’s what “cleaning up” a carving means. Not soap and water. Want to take something into the tub or shower with you? Leave your carving on the bench,, and take your rubber ducky instead! Otherwise,, learn to control your chisel and cuts. It’s the sign of a good wood carver,, not someone who simply tried to carve something. Thanks for sharing the details on this as you progress. Her hair is wonderful. Her arm & forearm look a little out of proportion too. But I am guessing that will come later after you get her back slimmed down? Could be a trick of the lighting or the photo angle too I suppose. Also, the outline of her breast appears to sit a little too high. No? This will be a wonderful piece when completed. Well as I said in the story,, it’s the nature of a work in progress. Her hair got done,, and this revealed her back was too full,,her hand is now in place ,,and her arms get done. Had I tried to finish her back,,and arms,,then go on to the rest it would have left me in a precarious situation with no wood to work with. So adjustments continue once fixed elements are in place. Similar to Doris’s Mare. She can’t carve the legs and hoofs to a finished state and then try to get the body to match. It’s similar here. As far as the breast lines go,, well,, it’s a toss up. It can depend somewhat on a particular build of a woman,,large,small etc. I also had to consider not having the entire breast show as most “Christians” can be somewhat prudish. I had to suggest it without showing anything. Heck,, even someone was hired to go back and paint in fig leaves for Michelangelos Sistine Chapel. So as a toss up between showing anything,, having her arm hide most of it..or having her doubled over just to hide everything would have taken away from the main intent of what her total expression must convey. The story it tells somewhat overrides the details. Really,, do you get what is happening here? Yup.. Is it important to show an entire breast to complete the story? It’s a judgment call.. artistic license to some extent. Get the story across even if all the T’s aren’t crossed nor all the I’s are dotted. Want to see some really odd physical carvings? Take a look at some of the original Tryptichs.. some look like mutants. But they still tell a story. Yep – wasn’t being critical – just wondered if I was seeing it correctly. As I said – I figured the arm would be worked on after the back to get the proportions right. That’s why it’s a WIP! Very good points re: the breast outline. Tricky edge to walk. Yep – gotta love the fig leaves eh? LOL! So silly. Looking forward to following the progress. Oh I know Chuck. Just for edification to anyone reading along the thought process and reasoning that goes on as a carving progresses. Compromises made,,adjustments,,etc. One thing I do have a problem with is this. And it can open a can of worms but something to consider. Should Adam have a navel, as well as Eve? Yes,,,then it indicates a normal birth. NO,,they who’s image are “we” made in if he as well as she were the original prototypes? Wouldn’t it have to exist in the original to be found in all later beings and used as it’s intended purpose? It should be there for very good reasons.And very good reasons it shouldn’t be found. Mark Mark Mark – you sure like to cause trouble don’t you? 😉 I say no, but since God formed him (using his hands presumably) from dust, wouldn’t the almighty have left fingerprints all over him? Maybe he left a big ol thumbprint where the navel would have been? Ah – gots ta love pondering the mysteries of the ages eh? I’m not causing trouble,,just asking a question. You wonder about the arm,,I wonder about the navel. I can fix the arm,,where do I go with the navel? Then again you can always put a fig leaf there when I’m done carving.